Unless you have been living under a rock, it is well documented that the Buffalo Sabres are in a full fledged rebuild mode. The decision was made to for a lack of a better term, gut out virtually the entire roster and start from scratch. This concept was embraced by most Sabres fans, as the Darcy Regier era of finishing 9th in the East and going nowhere fast had lost its appeal. The focus of the 2014-2015 Buffalo Sabres seems to be clear as day: The Sabres have a plethora of draft picks. And the fan base is totally focused on ‘taking’ to land prospect Connor McDavid. Hashtags #FailForMcDavid and #DishonorForConnor have become the go-to tags on twitter (for yours truly as well). Why the hype for McDavid? McDavid has essentially been deemed the #1 overall choice now for three years. Scouts have mentioned he has elite skating, vision, and puck handling. These traits are music to suffering Sabres fans ears as this Sabres team scores goals as frequently as the worst teams in the MLS Soccer League. Considering the Sabres have three 1st round picks in the 2015 NHL Draft, the optimism for this moment is through the roof in Western New York. 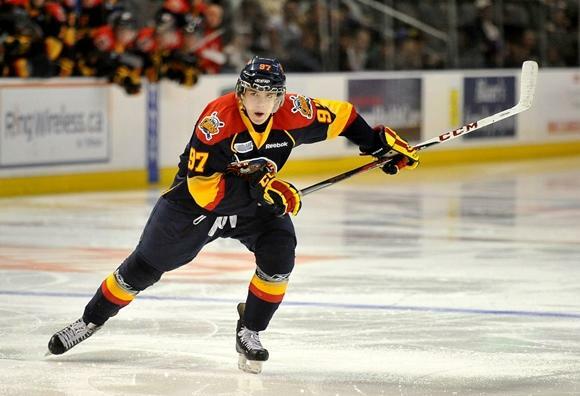 But should Connor McDavid the sole focal point for the 2014-2015 Sabres ON the ice? Assuming the Sabres finish last in the NHL in points (a very likely scenario) the chance of winning the NHL Lottery has decreased from 25% to 20%. Far from a guarantee. But Sabres fans should not paint doom and gloom either: This draft is deep, and offers other high-end prospects besides McDavid. Jack Eichel would be an excellent consolation prize. So instead of focusing on a 20% chance at best, why don’t we peek into the 80% on the ice right now. This is a very important year for the long-term vision that General Manager Tim Murray has in mind. The goal is to clearly identify who will be part of the long-term solution in Buffalo. And so far that vision appears to be very blurry. Cody Hodgson 8 games, 1 assist, -6 and 9 SOG: 9 shots on goal? For a player who is supposed to anchor the top line for Buffalo, this number is completely unacceptable. Cody has been virtually invisible the entire season. Cody needs to show more, and fast. Matt Moulson 8 games, 2 assists, -4 and 18 SOG: Moulson was signed to a pricey 5 year deal, and so far like the rest has showed very little with zero goals. Moulson can be streaky, so let’s hope the streak swings in the positive direction. Brian Gionta 8 games, 1 assist, -5 and 16 SOG: I understand Gio is here to be the ‘leader’ for the younger players to follow, but considering his role on the team, some production would be of some help. Drew Stafford 8 games, 3 assists, -4 and 15 SOG: Stafford has been an enigma during his tenure as a Sabre. Much like Tyler Myers, he started stronger and had slowly eroded over time. Do not see Drew as part of the long-term solution in Buffalo. Chris Stewart 8 games, 1 assist -4 and 26 SOG: A player that was an intriguing get in the Ryan Miller trade, the thought was that Stewart needed a change of scenery to get things going. 26 SOG is a decent number, so perhaps he will get something going soon. The salaries of the players above combined? $21,650,000. And the rate of return would make any financial investor cringe: 40 games, 0 goals, 8 assists, -23. This MUST change and fast for some of the younger players like Zemgus Girgensons, Sam Reinhart, Rasmus Ristolainen, and Nikita Zadorov, four players who clearly appear to be part of the core in the future, to develop properly. The poor start isn’t an issue of effort. When a team is losing, fans love to just throw around the effort excuse. The Sabres are TRYING. But the real question to me is: are they ‘trying’ correctly? Do they have the right system in place? Or the right coach? Make no mistake: I am a fan of Ted Nolan. In some situations, he is a very good fit for an NHL team. But does his style bring out the best in some of the young players on the roster? Are guys like Sam Reinhart, who appears to be a little lost so far in his rookie NHL season, going to be negatively impacted by Nolan’s style? Time will tell. But while it is nice to dream of what can be in the 2015 NHL Draft if the Sabres go to the podium and announce: The Buffalo Sabres are proud to select from the Erie Otters of the OHL, Connor McDavid’, let’s all put the 20 percent or less chance to the back-burner. ‘The Other 80 percent’ is just as crucial. This entry was posted in Buffalo Sabres, Uncategorized. Bookmark the permalink.